This Crispy Duck Red Curry came about purely by being requested (in the forum on our first website) by one of our members “Tony Milligan” and then other members voted for it. 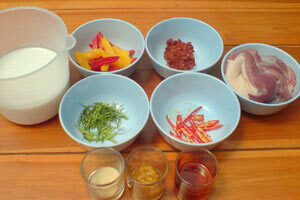 It ended up as joint favourite of “voted for recipes” members would like to see Khwanjai make, so she did! As I pointed out at the time, crispy duck is strictly speaking a Chinese recipe, but Khwanjai said “Okay, I’ll make something new” so here it is, as it was when unveiled for the first time ever. BTW this dish is absolutely gorgeous! Remove the skin from the duck meat, and slice finely, cut the duck breast in two, (assuming you have 1 x 300g breast) keep separate. 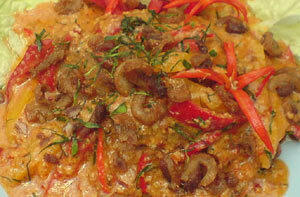 Pour half of the coconut milk into a hot wok or pan, then simmer 5-7 minutes until it reduces and cracks, see video. Do a taste test, (add palm sugar or fish sauce as you feel is right) test again, if you’re happy leave it alone! Lastly cut up the meat into bite sized slices and it’s….. Done! Serve hot lay the meat slices on a bed of fresh lettuce and cucumber; with some red bell pepper and chillies to garnish and sprinkle the crispy skin on top, with Jasmine rice or rice noodles as a side dish. Also we suggest a side dish of fresh salad, such as cabbage, crisp lettuce, cucumber and especially coriander. A nice delicately savoury flavoured soup to go with this is our Lettuce and Pork Soup which will balance out your whole meal and contrast nicely with the rich and spicy flavours of the curry. If you fancy something more substantial try our Pork Stuffed Cabbage Soup or maybe our Thai Steamed Eggs all of which are delicious! Watch the video, cook it, you’ll enjoy it! Print the recipe to make notes, top tips in the video. Share with foodie friends or ask questions below..